If you were planning a trip to Ladakh this year and were traveling by public transport; then below is the latest bus schedule of Leh to Pangong Bus service in the year 2019. 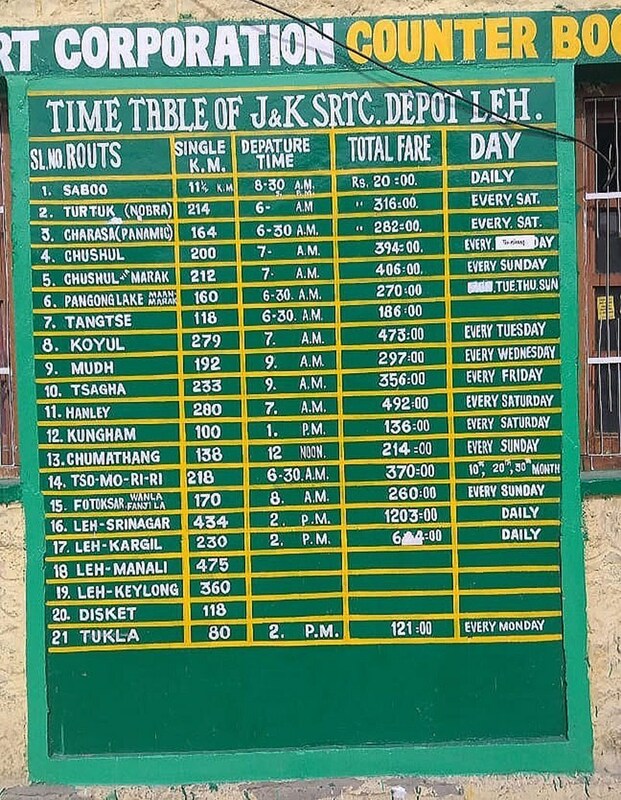 The image below is actually of bus service from Leh to all of the tourist places in Ladakh and it was clicked by a friend at Leh Bus stand last week. In this post, however, I will highlight buses from this list that you can use to travel from Leh to Pangong Lake. Before I go on talking about the bus service though, please note that the campsites at Pangong Lake have been removed by Ladakh administration this year. Now camping on the banks of Pangong is forbidden by law, much like it is in case of Tso Moriri. The only difference, however, is that in case of Moriri, there are campsites at a little distance from the lake and they will remain to be. On the other hand, all sort of construction, whether permanent or temporary, has been demolished at Pangong Lake. The rule states that campsites on state-owned land will now be considered illegal and will be removed. For more information on this topic, please read Camping at Pangong Lake Banned by Authorities. What this means for you as a tourist is that finding accommodation near Pangong Tso will now be challenging. In case you could not find a place to stay, then you would have to return to Leh by evening; in which case, traveling to the lake by Bus will not be the best choice. The post below only details Leh to Pangong Lake Bus service that you can avail after you have arrived in Leh. I am not including details here on you can reach Ladakh. If you want to get details on that as well, then I recommend you to please take a look at How to Reach Ladakh – A Complete Travel Guide. Once you have arrived in Leh either by public transport or flight, then how you can travel from Leh to Pangong Lake by Bus is what I will be discussing in this article. To better understand the bus schedules I have mentioned below, I will recommend that you also take a look at A Detailed road map of Ladakh. Take a look at the route near Pangong Tso and you will be able to relate the names of the villages I am mentioning below. Listed below are the buses that you can board from Leh to reach Pangong Tso Lake. All of these buses travel via the Karu -Sakti – Chang La – Durbuk – Tangtse route to arrive at Spangmik. Starting time from Leh Bus stand is early in the mornign and the bus reaches its destination by evening. The same bus then travels back to Leh the next day. Spangmik, Man and Merak are three villages located on the banks of Pangong Tso. Spangmik is actually slightly away from the lake but Man and Merak are right next to it. So to reach Pangong from Leh, you can actually board to a bus going towards either of these villages. There are three weekly buses scheduled for Pangong Tso from Leh Bus stand on every Tuesday, Thursday, and Sunday at 6.30 AM. These buses travel via Spangmik and Man to arrive at Merak. Fare per person is Rs. 270. Since the entire route till Merak runs next to Pangong, you can get off at any place en route. Chushul is a small village in Changthang Valley and it order to get to it, you will have to travel via Spangmik, Man and Merak. There are two weekly buses that you can board to reach Chushul. The first one starts from Leh every Wednesday at 7.00 AM. Fare per person is Rs. 394. Traveling by this Bus, you can get down at Spangmik to visit Pangong Lake as well. This bus travels via Erath and does not go to Man or Merak. Another bus for Chushul starts from Leh Bus stand every Sunday at 7 AM. This Bus travels via the villages of Man and Merak and fare per person is Rs. 406. Hanle is often considered as one of the hidden jewels of Ladakh. It is a very pretty village located right next to India – China border. A Bus from Leh leaves for Hanle every Saturday at 7 AM. This Bus travels via Spangmik, Erath, Chushul, and Nyoma to finally arrive at Hanle. Fare per person is Rs. 492. You can board this Bus from Leh and get down at either Spangmik, Man or Merak. Like Hanle, Koyul is another small village in Changthang Valley. The route to Koyul is same as that of Hanle until Nyoma. A bus for Koyul leaves Leh Tuesday at 7 AM. This is anoter bus you can board to get down at Pangong. I hope the details on Leh to Pangong Bus were of help. If you have any questions; or need any other information; please feel free to ask in the comments section below; or at our Community Forum; and I will be glad to answer. I am coming from Delhi.with my wife is it safe in may 2019 .how to plan to visit srinagar leg and Ladakh in 6-7days .and also suggest min. Budget kitna ho sakta hai. .. .i amcoming sringnar by 8th may in morning and leaving srinagar by afternoon on 14th may by flight.